Today I try my best to present you a tutorial on how to use bodysuits instead of full bodypaint! 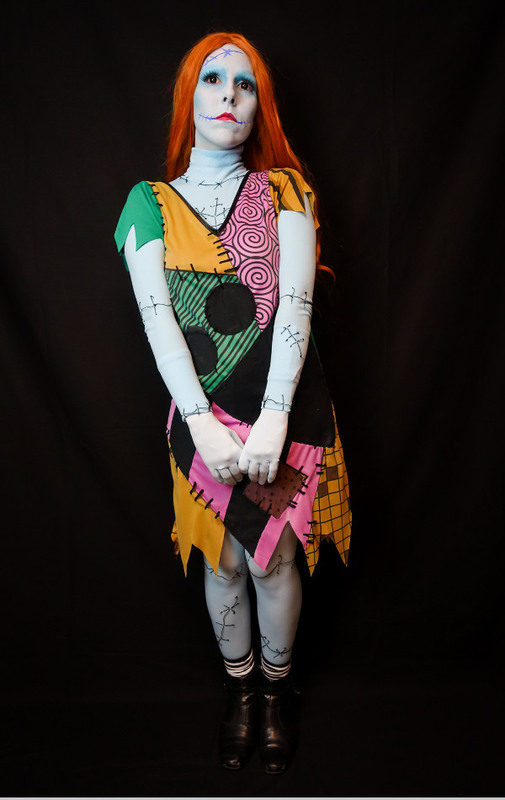 I show you how I made a bodysuit for my cosplays Emily from Corpse Bride and Sally from The Nightmare Before Christmas. I got tired of always using so much bodypaint so I came up with using leotards. 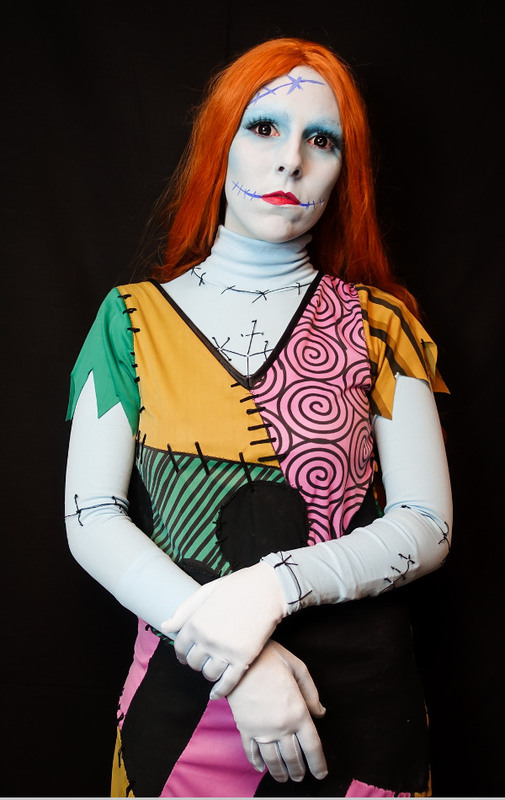 In this short tutorial I explain how I used leotards, tights and gloves! It really helps to spare some time while getting ready for cosplay. It's difficul to find fitting leotards, gloves and stockings and it's even more difficult if they should share the same color. One day on Instagram I found a shop called welovecolors which sells a whole range of bodysuits, leotards, danceware, stockings, thights and many more in so many different colors! So as I came up with the idea to replace full bodypaint with bodysuits I ordered different articles from their shop. For Emily I ordered a turtleneck leotard, tights and shoulder gloves in the color Sky Blue and the same articles in Aqua for Sally. Honestly by what I know now normal wrist gloves would be even better! As you see on the picture the gloves don't share the exact same color as thights and leotard because they are made out of a different fabric. If you like to achieve a homogenous look I would suggest to make armsocks out of thights instead of using store bought gloves. I'm propably going to make one for Sally. At first I altered the leotard to make it a tight fit. Therefore I sewed closer the arms of the leotard, this helps to achieve a smooth look and creates a better illusion. For a convention friendly use of the leotard I cut open the crotch and sewed in some push buttons. At last I adjusted the turtle neck to remove the turn-up and to complete the smooth look. Now it's getting more specific. 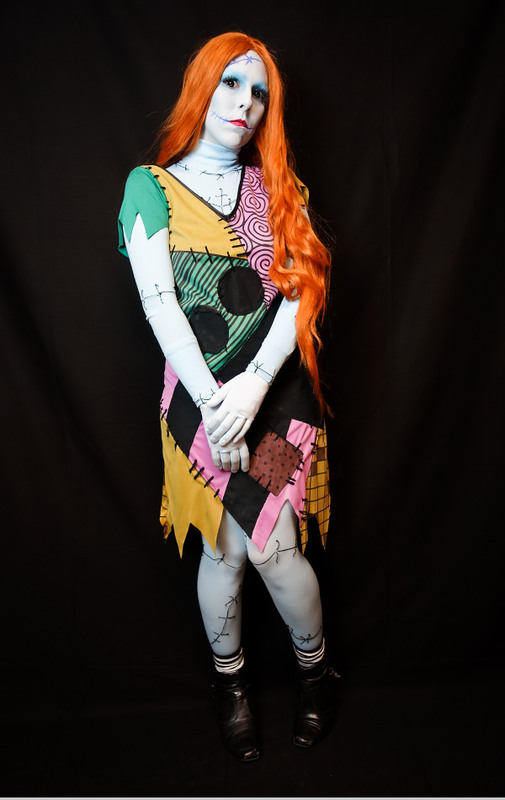 In the past I used a cloth arm with printed bones for my Emily cosplay. 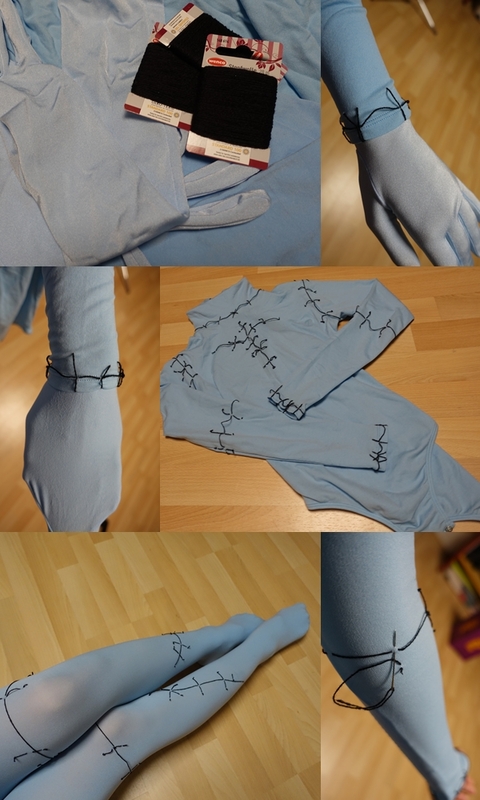 To help to put on the cosplay faster I sewed the bone arm onto the blue leotard by hand stitching. Be careful not to sew to tight since the leotard is made out of elastic cloth and you don't want to ruin your whole work when putting on the costume. 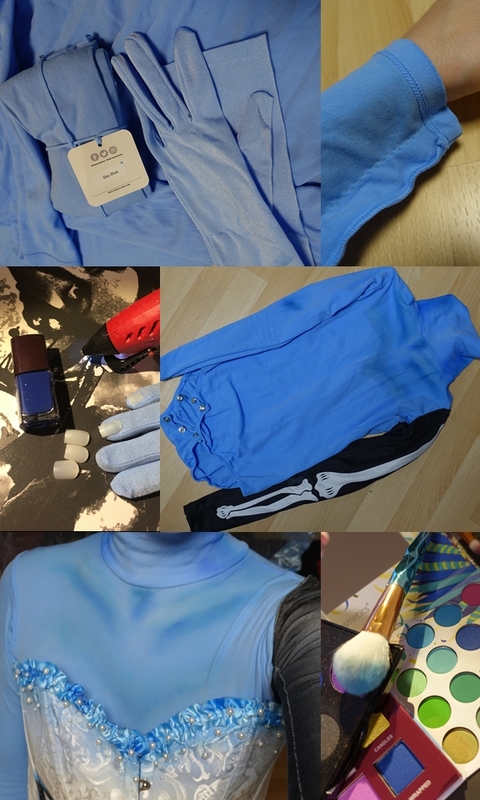 After finishing the sewing part I continued to give it a shading (breast, neck and collar bone) by using eye shadows in different shades of blue. Use a blend brush and blend in the blues in different layers. I think this is the most difficult part at all. Of course you can also use dye so you get a permanent look. I chose make up since I was not quite sure if I like the outcome. At last I chose to alter the gloves a little bit. With hot glue I stick fake fingernails to the glove to create a more natural look. I mean if blue would be a natural skin color. I did this while wearing the glove to make sure to find the correct position. Be careful not to burn yourself. After that I used some blue nail polish for the nails. In fact it would be easier to paint them before gluing them to the glove but the choice is yours. Now I only have to use a fitting bodypaint for my face to complete the cosplay! All in all I'm quite satisfied with the outcome! Even so this version of my Emily has a more instense blue. 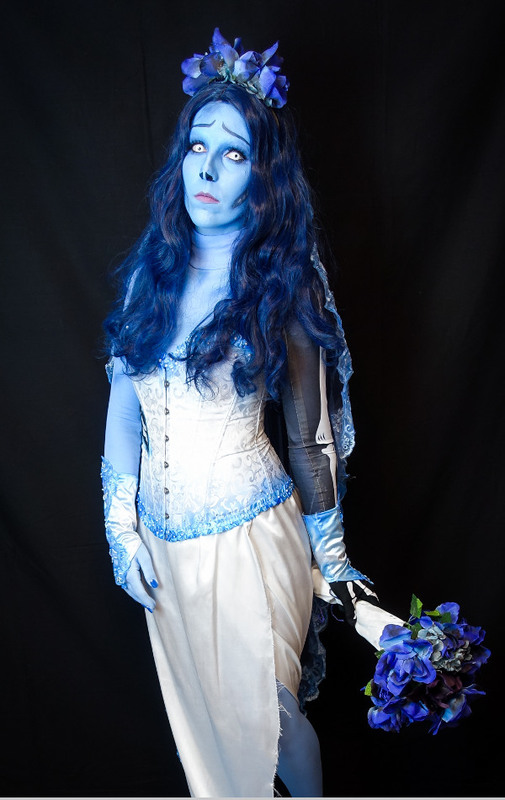 Perhaps I will remake her in a more decent blue some day! Also I'm surely going to use black contact lenses instead of these white ones. I simply don't like the look of them. Well let's go on with Sally! Starting with Sally I did the same steps as I did for the Emily body. I sewed the arms of the leotard tighter, cut open the crotch, included some push buttons and removed the turn-up of the turtleneck. These steps would apply for nearly every cosplay you'd like to do with leotards. While Sally is a ragdoll and she is covered with black stitches and seams, I used a thick black thread to apply these. You can use wool for example. It's important to not sew too tight since otherwise you can't put on the leotard properly. As I put on the leotard to make some pictures, I was too hasty and the thread ripped at one point. To avoid to stitch the seams too loose or too tight I put on the leotard and sew them on while wearing it. Same goes with the tights. It's not easy this way but it helps to find the perfect tention of the seams. Basically it's your choice were you place the seams. I also placed some at the wrist since I tried to cover the transition of the leotard to the gloves. In fact this is very easy and Sally is finished. 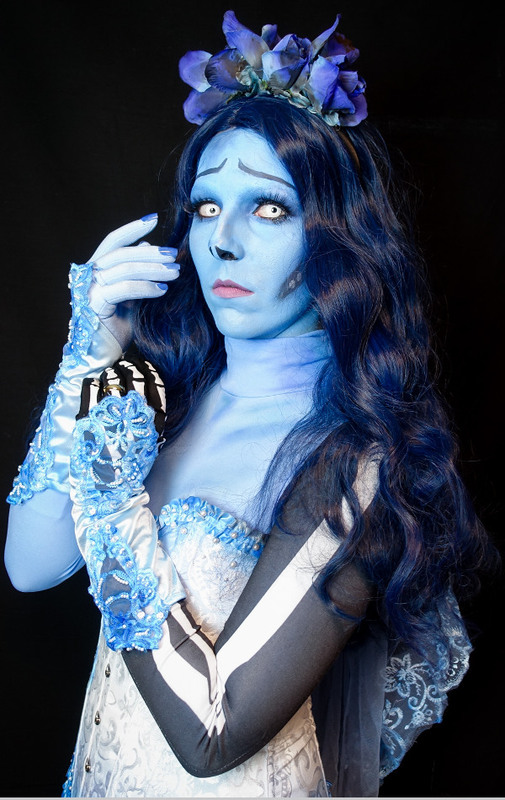 Of course you can add some shading to your suit or glue some fake nails to the gloves. Which I didn't because I like to keep the look of a ragdoll. As stated earlier the color of the gloves do not fit exactly the leotard and the tights. 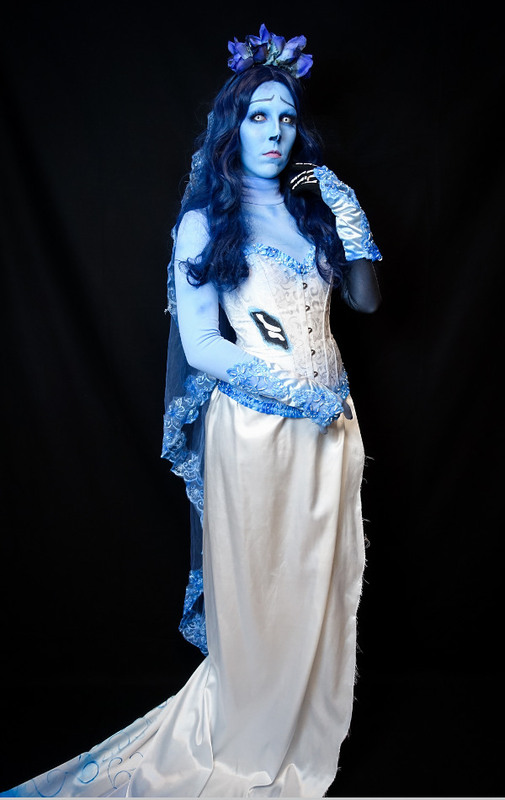 To achieve an more homogenous look I recommend to use tights and turn them into gloves. Now all you have to do is apply fitting bodypaint to your face and get in costume!